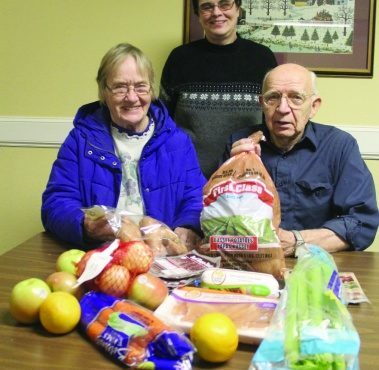 A local volunteer is putting forth extra effort to make a difference in the lives of others by assisting with a food provider program. Patsy Quinn of NYA recently started going the extra mile to help Fare For All, a local food program created to make fresh fruits and vegetables more affordable to Twin Cities families. In addition to food packages, left-over bread is also provided at the NYA site. “I usually try to bring a variety for the people so everyone has some,” she said. Quinn, as well as other local volunteers for Fare For All including Mary Lou Teubert and Orville Bachmann are certainly making a difference in NYA with residents picking up about 15 to 20 packages in November at Peace Village. The change to Peace Village from the previous location of the Lions Building is making an impact also. “Some of the people that live here don’t have vehicles and don’t drive,” said Quinn. “For them to go and get their package, it didn’t work.” Orders must be taken in advance for the packages, which typically offer 40 percent in savings part of the goals of Fare For All to provide savings by purchasing fresh fruits, vegetables and frozen meats in bulk and delivering savings to customers. The program has no income requirements and is open to everyone who is looking to save money. To order for the Dec. 18 distribution, contact Patsy Quinn at (952) 466-3304. Peace Villa is located at 308 N. Faxon Road. For additional dates and a map of Fare For All locations, visit www.fareforall.org.